In 2005, conservationists launched a plan to establish rhino populations in seven parks in Assam, but this proved to be a much bigger challenge than was expected. A rhino raised at the Center for Wildlife Rehabilitation and Conservation being released at Kaziranga National Park in 2015. Credit: Anjan Sangma/IFAW-WTI. Launched in 2005, the Indian Rhino Vision 2020 aimed to boost the population of rhinos in Assam State and expand the species’ range within the state from three protected areas to seven. 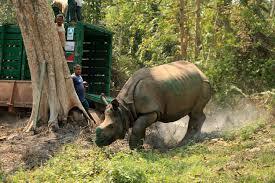 Manas National Park was the first to receive translocated rhinos. The animals appeared to adapt well to their new home, but poachers repeatedly struck the park. The program then turned to Burachapori Wildlife Sanctuary, but the rhinos moved there grew sick and died. Conservationists still believe the overarching goal of boosting the state’s rhino population to 3,000 by 2020 is achievable. On the evening of January 13, 2013, Deba Kumar Datta was on his way to a remote camp inside Manas National Park, a 500-square-kilometer (193-square-mile) protected area in the northeastern Indian state of Assam.Datta was excited that Sunday. It was the beginning of the Magh Bihu harvest festival in Assam. The day also marked Datta’s fifth anniversary at Manas National Park. As a senior project officer with WWF India, he had spent the last five years tracking the movements of greater one-horned rhinoceros (Rhinoceros unicornis) that had only recently been reintroduced to the park.Many of these rhinos—brought in from different parts of Assam—were thriving in their new residence, and Datta was keen to celebrate his joy with some forest guards. But his happiness was short-lived.Datta had barely driven 100 meters when a villager called him to say that a rhino had been killed a few kilometers away. Datta’s team rushed towards the location of poaching with the forest department staff. There, in front of them, was Iragdao — an adult male rhino, lying dead on his side. For conservationists, Iragdao’s death was tragic. He was one of the last adult breeding males in the park at the time of his death. He had also been one of the first two Indian rhinos to be reintroduced to Manas as part of a high-profile translocation project. A greater one-horned rhino in Assam State’s Kaziranga National Park. Credit: Udayan Dasgupta for Mongabay. This ambitious project, called the Indian Rhino Vision 2020 (IRV 2020), was launched in 2005 in response to the declining population of rhinos in Assam. By the late 1990s, poachers had wiped out hundreds of rhinos across the state. More than 90 percent of Assam’s rhinos were now concentrated in just one park — Kaziranga National Park— with small populations in Orang National Park and Pobitora Wildlife Sanctuary. This was worrying. With the distribution of rhinos limited to a handful of protected areas, the species was at heightened risk of being decimated by threats like diseases, natural disasters or poaching. In 2005, when Assam was celebrating 100 years of conservation in Kaziranga National Park, the state government and conservationists came up with an elaborate plan to change the status quo. Kaziranga had nearly 1,855 rhinos then, with an additional 68 in Orang National Park and 81 in Pobitora Wildlife Sanctuary. Experts believed they could increase this number to 3,000 within the next 15 years. This overarching goal led to the birth of IRV 2020 — a collaboration between the Assam Forest Department, the Bodoland Territorial Council, WWF India, the International Rhino Foundation, the US Fish and Wildlife Service and various local conservation groups. The IRV 2020 strategy called for expanding the species’ range from three protected areas within the state to seven. This would involve translocating wild rhinos from Kaziranga and Pobitora to parks that no longer harbored these animals: Manas National Park, Burachapori and Laokhowa Wildlife Sanctuaries and Dibru-Saikhowa National Park. IRV 2020 aimed to establish or strengthen rhino populations in seven protected areas across Assam State. Credit: Google Maps. To achieve this, IRV 2020 would continue to boost the protection of existing rhino populations in the state and better manage their habitats. 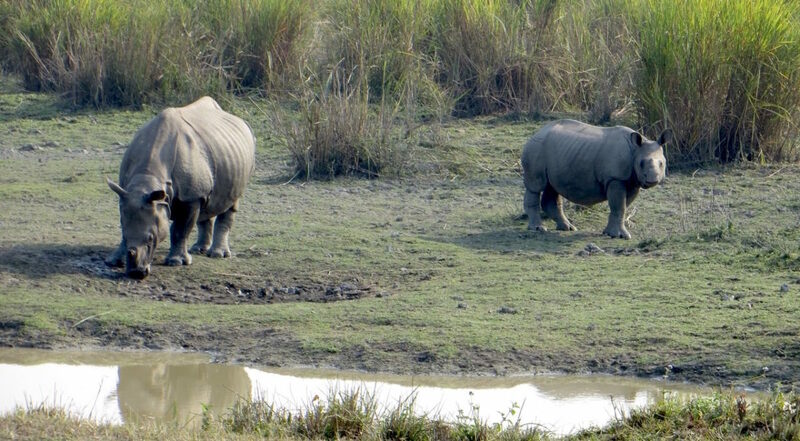 After a series of preliminary checks to assess the current state of security and habitat in Assam’s various protected areas, and the support they would need in the future, the state’s newly instituted rhino task force made its decision: Manas National Park would be the first protected area to be restocked with rhinos and Datta’s team would monitor the animals. Manas, located at the Himalayan foothills, had its own thriving population of more than 100 greater one-horned rhinoceros until the beginning of the 1990s. It was even declared a World Heritage site in 1985 by UNESCO. But a spate of poaching incidents during a decade of civil unrest between 1989 and 2001 wiped out every single rhino from the park. The experts believed that by boosting security and prepping the habitat, Manas could be turned into a haven for rhinos again. “Manas had the highest potential then,” said Amit Sharma, WWF India’s senior coordinator for rhino conservation. But reintroducing rhinos to Manas — and keeping them safe — was not going to be easy. While members of IRV 2020 were figuring out their strategies, another organization was moving rhino babies to the park. These calves, orphaned during floods or by poachers, had been hand-raised at the Center for Wildlife Rehabilitation and Conservation(CWRC) located near Kaziranga National Park. Between February 2006 and February 2008, CWRC moved four hand-raised calves to a small, solar-fenced enclosure within Manas. This enclosure, called a boma, let the calves explore their new habitat under constant supervision. “Inside the boma, we kept a check on the calves’ health status, but they were learning to find food, water and cover themselves,” Rathin Barman, head of CWRC, told Mongabay. While the four rhino calves were learning to survive on their own inside the boma, Manas was going through a frenzied phase of rebuilding as part of IRV 2020. Experts fabricated sturdy, safe crates to carry the animals; built drivable roads to ensure a smooth ride; set up wireless networks; erected anti-poaching camps across the park for effective monitoring; and posted additional forest department staff. They also trained the forest staff and held sessions with the local communities to help them welcome the new rhinos to their neighborhood. Finally, in 2008, Manas was believed to be ready for rhinos. 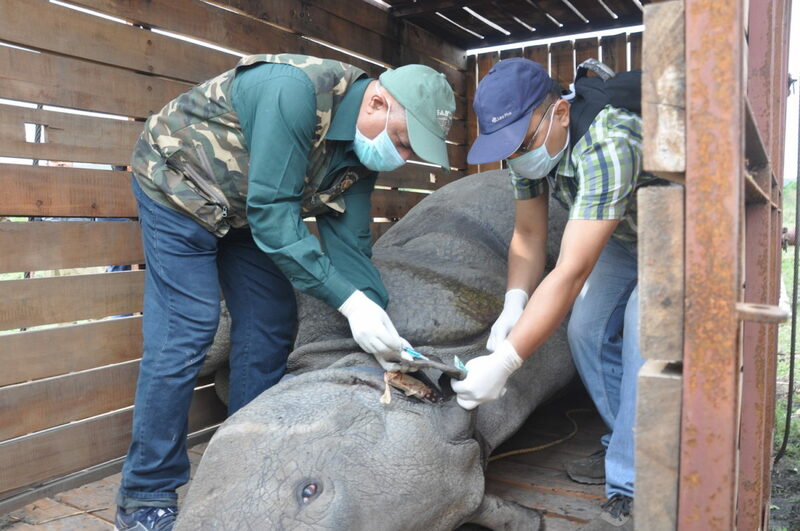 On the morning of April 11 that year, amid tight security, veterinarians attempted to tranquilize four adult rhinos in Pobitora Wildlife Sanctuary, located about 40 kilometers (~25 miles) east of Guwahati. They tracked the animals for several hours, trying to cordon them off using elephants as cover. Then, after a number of misses, the vets darted two rhinos: a 10-year-old and a seven-year-old male rhino (who would later be named Iragdao). These 1.5 ton sedated animals were lifted into specially crafted crates wedged inside trucks. Secure within the crates, the rhinos departed Pobitora at about six in the evening among heavy police cover. The local people, who had been waiting at the exit gate to catch a peek of “their” rhinos, cheered them on. By 7:30 the next morning, both rhinos were wandering through the vast grasslands of Manas, each fitted with a radio collar. Unlike the rescued rhino calves that were still testing the waters inside the secure boma, these adult male rhinos were released directly into Manas’s wilderness. Following the rhinos’ release, Datta and his team began monitoring their movements, sometimes following the signal of their radio collars, sometimes tracking the footprints they had left behind in the marshy soil. Everything was on track. Apart from a few incidents of straying, the rhinos had settled in separate parts of the park and seemed to have adapted well. The first phase of translocation was deemed a success, and the translocation core committee announced its next plan: it would move 18 more rhinos from Kaziranga National Park and Pobitora Wildlife Sanctuary to Manas by March 2009, turning the park’s rhino population into a self-sustaining one. But their plan hit a snag. One of the biggest challenges turned out to be the difficulty in obtaining etorphine — a major component of the tranquilizing drug used to sedate large wild animals like rhinos and elephants. Etorphine, an opioid that is about 1,000 times as potent as morphine, is classified as a Schedule I narcotic drug in India. This means that its import, export, manufacture, sale, storage or distribution is illegal. Procuring the drug even for a government-supported project like the IRV 2020 has proven to be a lengthy, laborious process,conservationists say. 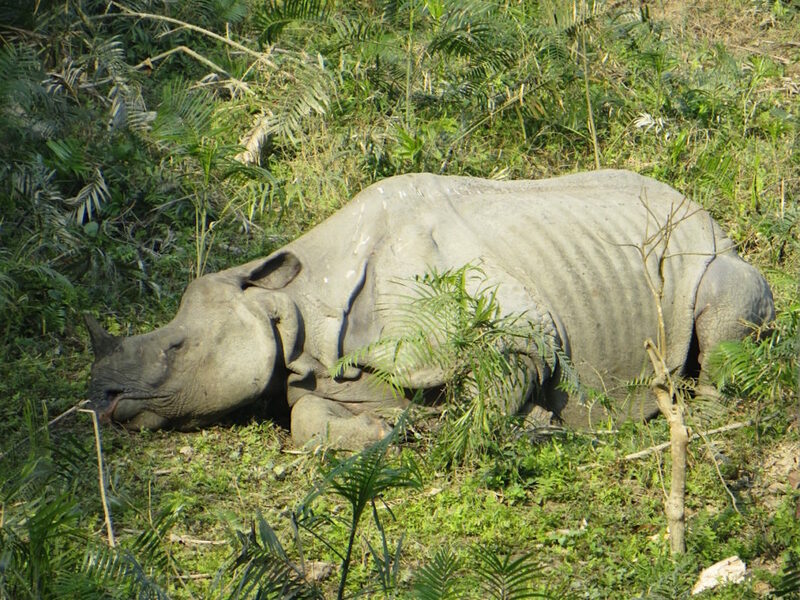 Unfortunately, alternative drugs do not work well in the greater one-horned rhinos, Bibhab Talukdar, Asian Rhino Coordinator for the International Rhino Foundation, told Mongabay. Talukdar is also the Chair of the IUCN SSC Asian Rhino Specialist Group and Secretary General of Indian NGO Aaranyak. The teams finally managed to get a fresh batch of etorphine in 2010, and on 29 December 2010, they moved two adult females from Pobitora to Manas. By March 2012, the teams had moved 14 more animals from Pobitora and Kaziranga to Manas, bringing the total number of rhinos translocated under IRV 2020 to 18. A one-horned rhino loaded into a crate for translocation. Photo courtesy of WWF-India. The rehabilitation center (CWRC) independently introduced 10 rescued rhino calves to Manas between 2006 and 2016. Some of these translocated and rehabilitated female rhinos went on to give birth to calves. A few rhinos became mothers twice. 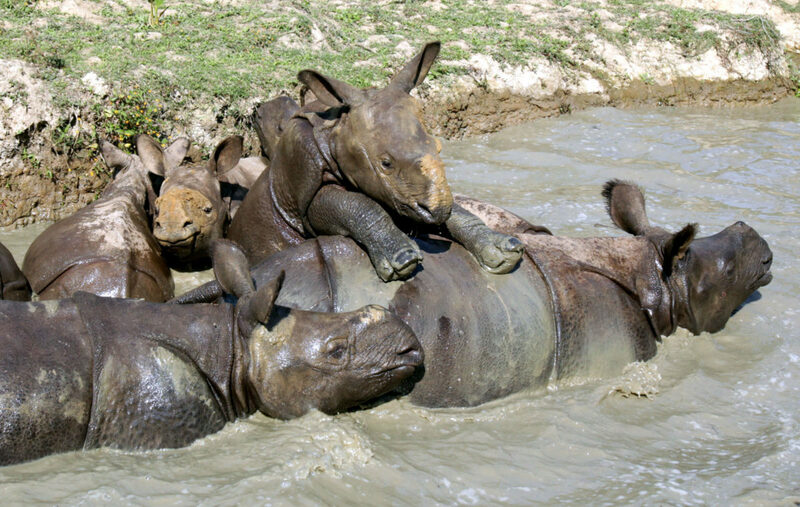 By 2015, 14 calves were born, increasing Manas’s rhino population to 32, up from zero in 2005. Despite this baby boom, conservationists were not celebrating. Between 2011 and 2016, poachers had struck Manas repeatedly, killing 10 rhinos. Iragdao was one of their victims. These poaching incidents were a blow to the expensive operation. In 2013, IRV 2020 decided to stop further rhino translocations to Manas. They would first focus on improving the security of the park, they said. 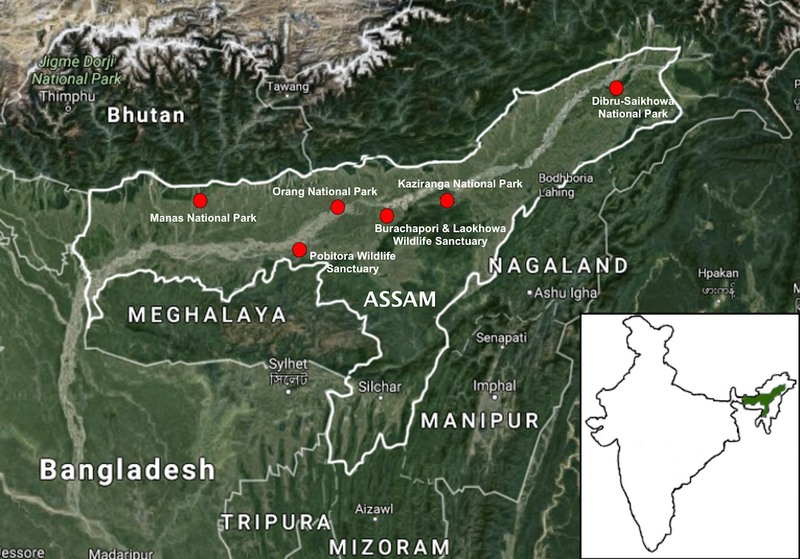 With translocations to Manas on hold, the IRV 2020 team shifted focus to a second protected area —Burachapori Wildlife Sanctuary. One-horned rhinos roaming in Kaziranga National Park. Credit: Udayan Dasgupta for Mongabay. Like Manas, Burachapori once had its own population of rhinos. In the early 1980s, Burachapori was estimated to have more than 70 rhinos, many of which were killed by poachers within a short span from 1983 to 1984. Of the rhinos that survived, some died due to natural causes. Others moved away to relatively safer protected areas nearby, such as Orang and Kaziranga National Parks. By early 1990s, Burachapori’s rhino population had plummeted to zero. Between 2013 and 2016, Burachapori was prepped for the arrival of rhinos. Steps were taken to make its habitat rhino-friendly, and security was intensified. Like the boma created for rhino calves in Manas, experts built a 150-hectare (~371-acre) rhino enclosure in Burachapori. This would help the reintroduced rhinos adapt to the new habitat before they were allowed to move freely and explore the wild. The enclosure in Burachapori is necessary, Sharma said, because it is a small park (only 44 square kilometers or 17 square miles in area) surrounded by villages. 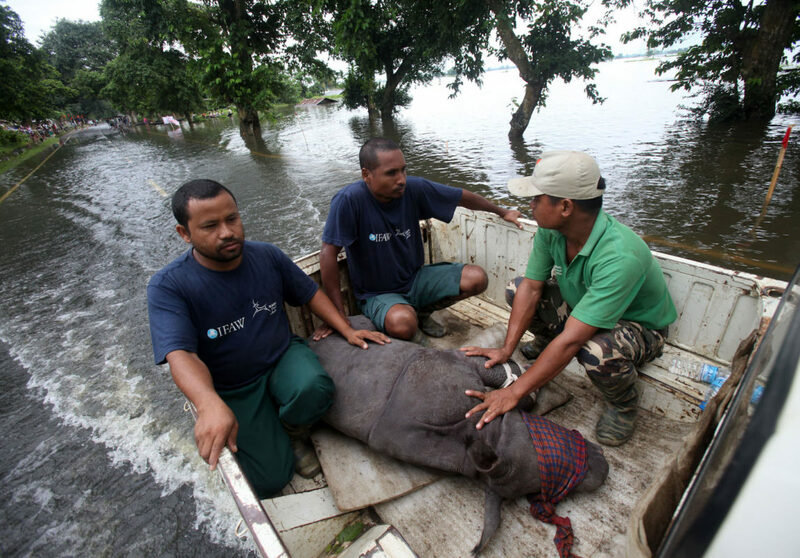 An infant rhino rescued after struggling in floodwaters in Kaziranga National Park. Credit: Subhamoy Bhattacharjee/IFAW-WTI. “Even during the recent floods in Assam, the calf held her ground, and as water levels rose, she constantly moved to higher grounds. She also responded well to the regular supply of fresh fodder and other mineral supplements provided by the team at Burachapori. And she was doing well thereafter,” Sharma wrote in a statement in November 2016. Unfortunately, Ramani’s health began deteriorating in the latter part of September. Despite round-the-clock veterinary care, she died on October 26. The precise cause of Ramani and her mother’s death remains unknown. IRV 2020 is currently re-assessing their experience at Burachapori, and further translocations are on hold. A greater one-horned rhino in Kaziranga National Park. Credit: Udayan Dasgupta for Mongabay. IRV 2020 started out with a goal of increasing rhino numbers to 3,000, with the animals distributed across Assam’s seven protected areas. The program began smoothly, but the ride has been bumpy ever since. Sourcing etorphine, the tranquilizing drug of choice, remains a difficult and unpredictable task. Poaching continues to be a looming threat to rhinos that are reintroduced to new parks. Moreover, veterinarians and conservationists are yet to figure out treatments for diseases affecting these big herbivores. Consequently, expanding the range of rhinos to seven parks across Assam in the next three years looks unlikely. While IRV 2020 will continue to attempt translocating rhinos to Manas National Park and Laokhowa-Burachapori Wildlife Sanctuary complex, getting Dibru-Saikhwa National Park (the seventh park in the list) assessed and ready for rhinos by 2020 might be a big challenge, Sharma said. Despite these setbacks, conservationists believe that achieving a population of 3,000 rhinos by 2020 is still possible. “As of March 2017, Assam has at least 2,600 rhinos and hence 400 rhinos in next four years may be still achievable if government is able to check rhino poaching incidences in Assam,” Talukdar said. This article was originally published on Mongabay. Read the original article here.